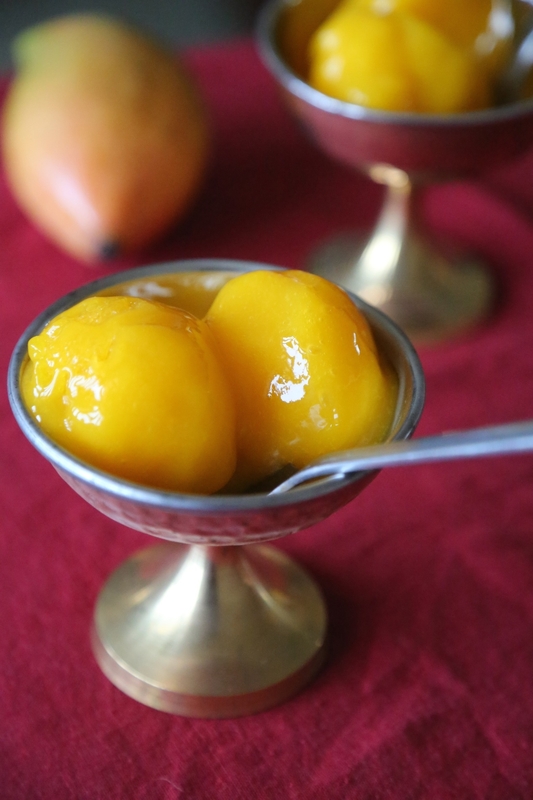 Totapuri is a unique mango with a distinct flavor and shape that grows mostly in Tamilnadu and Karnataka. it has a thick skin, is very aromatic and high in sugar. Called Tota or parrot because of its odd parrot head shape this mango also has a conspicuous flavor that sets it apart from many other mangoes during the season. 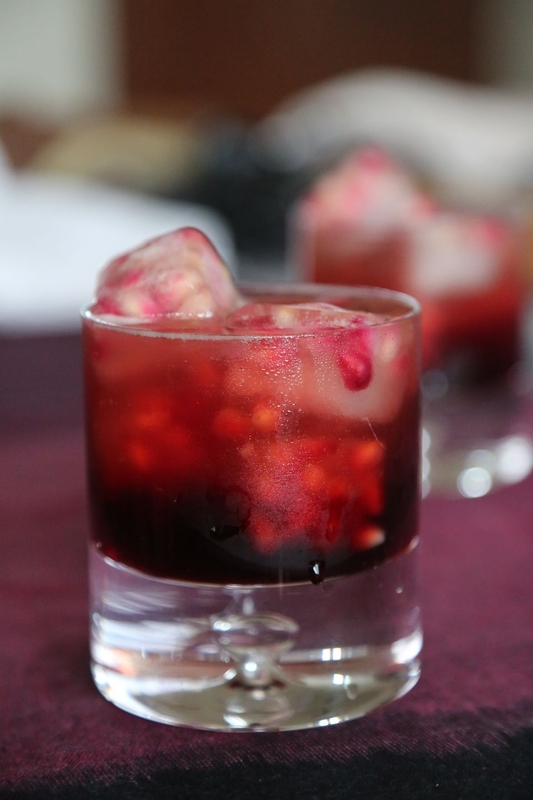 Alcohol has a lower freezing point than water and helps to produce a smooth and less icy dessert. You can omit the alcohol if you prefer. 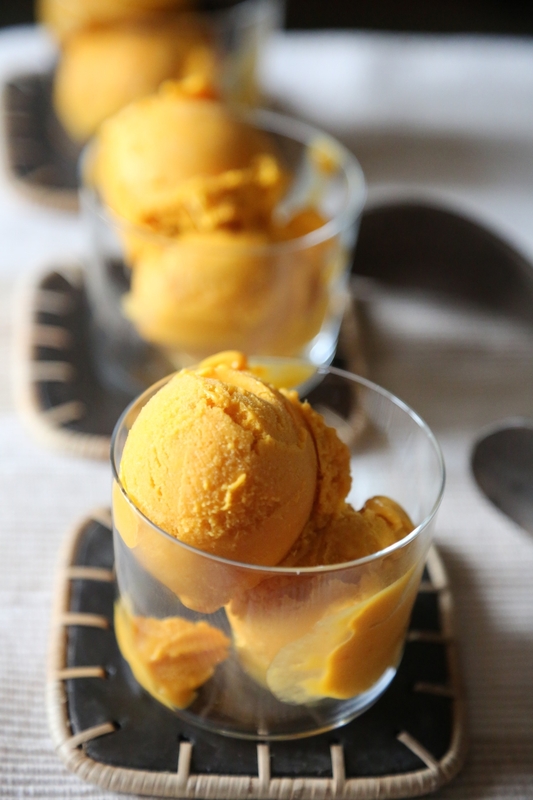 There is a science to making a good sorbet. Here are a few tips before you begin. Use good fruit- as sweet and aromatic as you can find. It is the key and only real ingredient in the sorbet so it must be good. The higher the natural sugar content of the fruit the less refined sugar you have to add. Fruits high in pectin produce good sorbets- stone fruit like peaches, berries and apple. Pectin is a natural thickening agent so when the sorbet freezes it sets quickly and you get a velvet texture. So the ideal fruit is one that is sweet, aromatic and has pectin. 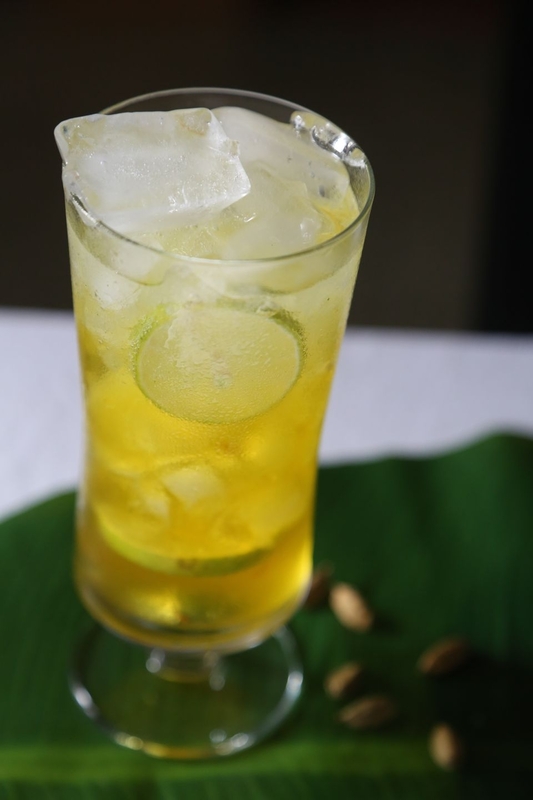 Mango is low in pectin but its thick pulp, aroma and high sugar content still make it a good contender. Sorbets made from pulpy fruit and compotes are far better than those made from juices where the water content is high, like say pomegranate or watermelon juice. Both these fruits have a high sugar content but also a high water content. If you want these flavours in a sorbet I'd recommend combining it with a fruit pulp like apple which has a mild flavour but lots of pectin. The ideal sugar concentrate for a smooth sorbet of water to sugar is 20%-30% sugar that is about 3/4:1 ratio but in a warm climate like ours I do a 25%. If you want to really get this right use a refractometer, which will tell you what the percentage of sugar in your sorbet mixture is. You can also believe it or not float a raw whole egg in your sorbet puree. Lightly run the are egg in some water. Then place it in the centre of your prepared and cooled puree. If it floats your puree is thick enough to go into the ice cream maker. Set the mango pulp to cook on a low heat in a non stick pan and cook until it loses 25% of its volume and becomes thick. Cool completely. Heat water and sugar in a pan on medium heat and cook until volume reduces by half. Do not brown the sugar and avoid stirring it, only swirl the pan if required. Cool completely. Add cooled sugar syrup, corn syrup, Tequila and lime juice to cold mango pieces in a blender and purée until smooth. 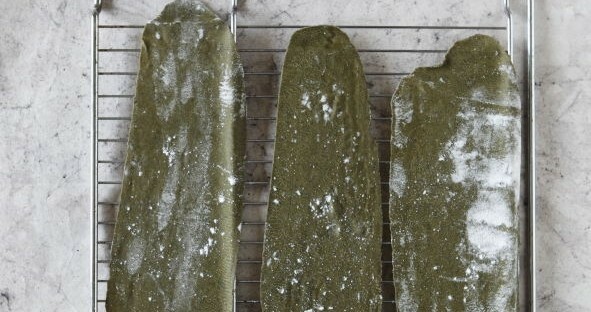 Cover tightly and refrigerate 4-5 hours. Put this mixture into your ice cream maker and follow manufacturers instructions. Store sorbet in an airtight container. WHISK THE INGREDIENTS TOGETHER FOR THE SALAD DRESSING. ADD SALT TO TASTE. RESERVE. 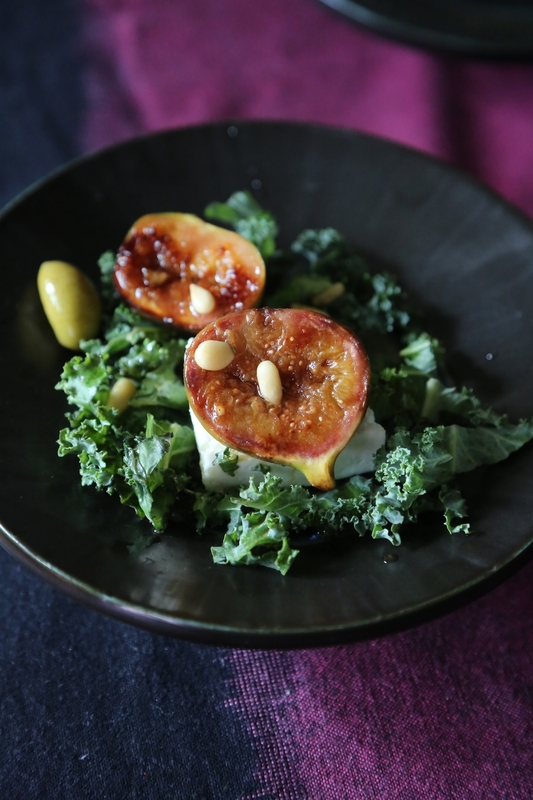 HEAT 1.5 TABLESPOONS OF VEGETABLE OIL IN A SKILLET ON MEDIUM HEAT AND GRILL THE FIGS ON BOTH SIDES ABOUT 3-4 MINUTES. DRAIN ON TO A PLATE WITH TONGS. SPRINKLE LIGHTLY WITH SALT AND PEPPER AND RESERVE. ADD THE DRESSING TO THE WARM PAN AND SWIRL IT ABOUT FOR A MINUTE. STRAIN AND RESERVE DRESSING. Place the peaches and sugar in a medium saucepan over medium heat. Cook until the peaches are very soft, stirring from time to time to prevent burning. Cook until peaches are thick and bubbly and most of the water has evaporated. Allow it to reach room temperature then puree. Sieve through a strainer to remove any fibers or bits and pieces. Cover and refrigerate 4-5 hours or overnight. This mixture must be very cold. Blend together the chilled cream, dahi and vanilla and pass through a sieve. Stir into cold peaches until thoroughly incorporated. Pour into an ice cream maker and churn according to manufacturer’s instructions. Set the ingredients for the syrup to boil on a medium flame. Let the volume reduce by half. Switch of flame and strain the syrup. Reserve. Combine all the ingredients for the baklava in a mixing bowl. Reserve. In a large baking tray place 2 sheets of phyllo at the bottom. brush generously with oil or butter and ensure that the sheets are uniformly greased. Lay 2 more sheets over this and butter or oil again from end to end. Spread the nut filling all over these sheets. Cover with 2 more sheets of phyllo. Oil or butter them from end to end. Place 2 more sheets over the baklava and brush with remaining butter or oil. 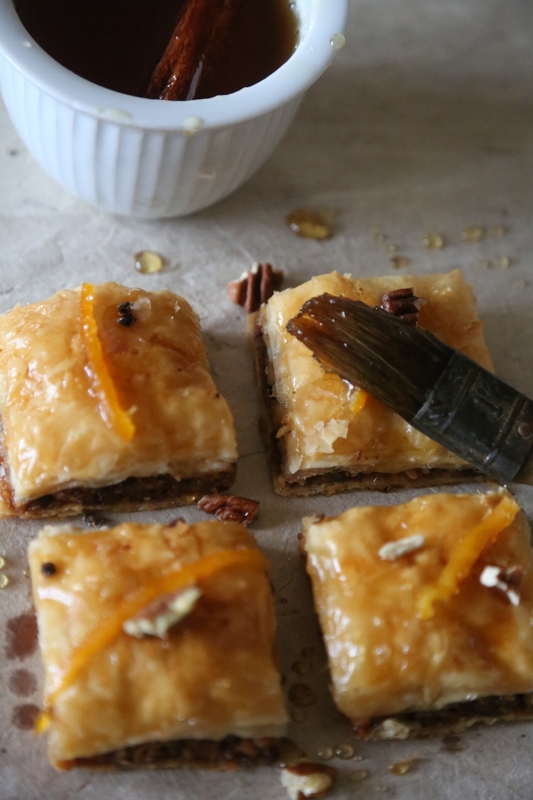 Using a sharp kitchen knife cut into the baklava to form 12 equal squares. Do this slowly to prevent the sheets from tearing. Your knife doesn't have to go right through all the layers but once the phyllo bakes it will be easier to separate the pieces. Bake about 35 minutes until golden brown. Remove from the oven and cool 30 minutes. Using a knife gently separate the 12 pieces. Brush generously with the honey syrup. Ensure that the syrup coats the bottom of the baklava as well. This will keep refrigerated for upto 2 days in an airtight container but serve it as soon as you can because in a humid climate the pastry can soften and lose its crispness. Bring a large stockpot or pateela of water and a half teaspoon of salt to a bubble. The pot must be spacious so as to allow the pasta to cook easily without sticking to each other. if you use fresh pasta your sauce must be ready at the same time because fresh egg pasta cooks much faster than store brought, commercially dried pasta noodles.Pasta should ideally be undercooked a minute, drained and tossed in a pan of hot sauce to complete the cooking. This allows the pasta to absorb the flavors of the sauce. While the water boils prepare the sauce. •	Melt butter and olive oil in a large skillet on a medium flame. •	Add celery and carrots. Cook until they soften about 1-2 minutes. •	Add garlic and hot pepper flakes and sauté until fragrant. If the pot of water is boiling add your pasta. If its store brought it will cook longer, if its home-made and fresh it will take less than 2-3 minutes. Add all the pasta, stir gently with a pasta tong or chappati tongs to separate noodles, you can also use a large fork. Cook about 1 1/2 to 2 minutes. The thicker the pasta and the drier, the longer it will take to cook. You will need to pull out a noodle from time to time and take a bite to see how well it’s done. Pasta should be al dente (to the tooth) when its served, just a bit undercooked with a little resistance when you bite into it. In India’s warmer clime pasta cooks faster so I undercook mine by a minute and a half. This way by the time its been tossed with a hot sauce and carried to the dining table its still al dente. Drain pasta completely in a large colander. Shake colander from side to side. Remember to save one cup of the pasta water. •	Add beets, pasta water and a teaspoon of salt to your sauce. Stir together so the ingredients are all well incorporated. Add your drained pasta and toss to coat evenly. •	Switch off flame and portions pasta into 4 bowls. Garnish with fresh basil, pine nuts and Parmesan. This fresh pasta dough can be used to make Lasagna or flat ribbon pasta through a hand crank machine to make Fettuccine and Tagliatelle. Tastes great with my mushroom and garlic sauce. Most recipes will have you blanch the spinach and squeeze out all the water but you lose nutrients like vitamin B, C, folate and thiamin all of which are water-soluble. Blanching helps spinach to retain a perkier green color but as it will be boiled again later you will lose some color anyway. Put ¼ cup of water into a large skillet or pot over medium heat. Add spinach and cook until completely dry, about 8 minutes. Turn from time to time to ensure leaves don't burn. Cool then finely chop spinach. Whisk eggs and spinach together. Sift flour into a mound on a clean surface or use a Parat or large Thali. Use your hand to make a well in the center. Pour spinach and egg mixture into the well. 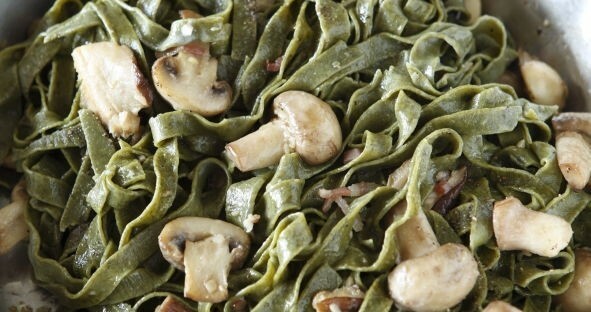 Using a fork, gradually incorporate flour into spinach and egg mixture. When dough becomes sticky and thick remove the dough from the fork and use your fingers to knead flour into spinach mixture with fingers until dough is no longer sticky. Some pasta recipes recommend using both hands but in India we generally knead chappati dough with one hand until it has come together and then use both hands to vigorously knead the dough. Add more flour as required. Form dough into a smooth ball. Press your finger into the center of the ball of dough. If the dough clings to your finger and feels sticky you need to add more flour and knead the dough again. Wrap the dough in plastic or put it in a zipped plastic bag and let it rest outside for 25 minutes. If its very hot and humid reduce this time to 15 minutes. Dust your hands and a flat and clean surface with flour. Knead the dough again. Knead with the heel of your hand until smooth, about 3 minutes. Cut dough into 4 pieces and cover with a damp kitchen towel if the weather is dry or a clean and dry cloth in humid weather. Work with 1 piece of dough at a time. Dust the surface with flour and roll the roll into an oval shape about 5 inches long and 2-3 inches wide. Dust from time to time with flour to ensure the dough doesn't stick to the surface. Set rollers of your machine on widest setting. Ensure machine is screwed tightly to the surface you are working on. Set up a tray or a pasta drying stand to hang your noodles. If you are working in a hot and humid environment I would suggest turning on a fan. Slowly lift the slightly rolled pasta. Hold one end and feed the other into the rollers. As it slides into the rollers continue to hold the other end so the pasta angle doesn't change. Roll it through 2-3 times. It will get smoother and longer. Next decrease setting by 1 notch and repeat movement. With each notch the pasta will get thinner and longer. Depending on how many settings your machine has keeping reducing the thickness of the pasta. If you are planning to cut the sheets into flat, ribbon noodles do not make them too thin and possibly avoid the last 1 or 2 settings. If at any point you find the pasta is getting damp sprinkle with flour or fine semolina before you run it through the rollers again. Lay or hand pasta sheets. If damp sprinkle with some fine semolina or flour Cover pasta sheets with clean kitchen towels to keep from drying. Its important pasta doesn't dry before you cut it into shapes. at this point the pasta can be used as sheets of lasagna. To cut into Fettuccine or Taglierini set your pasta machine rollers accordingly and run the sheets through them. Place a tray under the machine to collect the feed of noodles. if you plan to cook them immediately toss the noodles with dry semolina or flour to prevent them from sticking. Otherwise hang them to dry on a stand or lay them out on a tray to dry. Continue to dust and roll the pasta until you have a 10-11 inch long and 5 inch wide piece of dough. Gently roll the dough into a tube. Roll it loosely, don't press down on it. 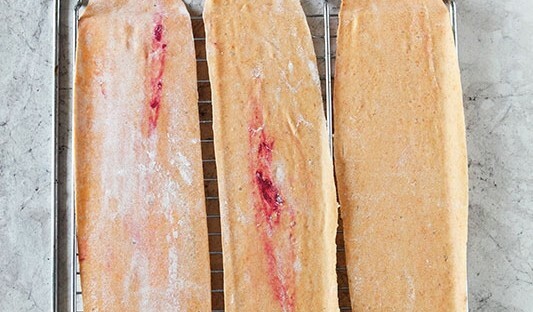 Using a sharp kitchen knife, a pizza wheel or a non serrated pastry cut slice through the roll to form long strips. 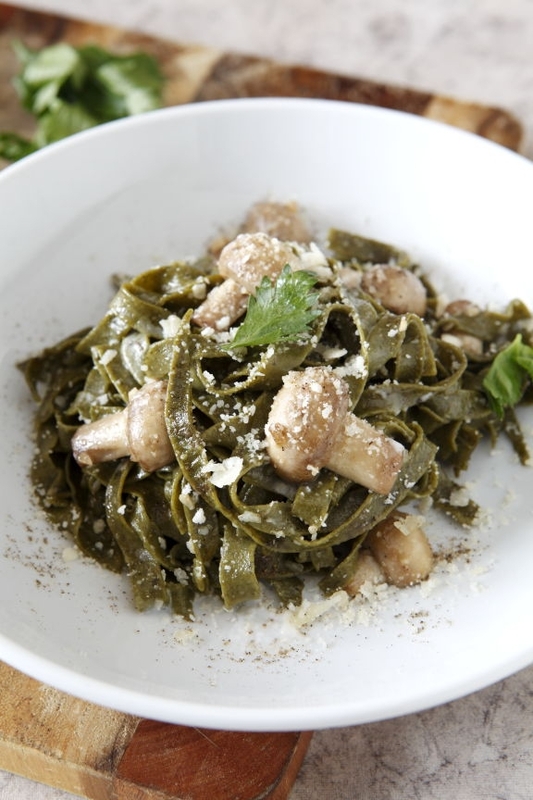 You can cut the strips thick or thin depending on the kind of pasta you prefer. Shake open each strand. Hang or lay the dry. The best way to dry pasta is in the open at room temperature. I don't recommend freezing freshly made pasta. You may as well by it from a store. Steam carrots until very soft and tender. Mash thoroughly and pass through a fine food mill or a sieve to ensure there are no lumps. If the puree has too much liquid cook it in a non-stick pan until it loses moisture. It should be a soft, fluffy mash. For the Dough: In a large, parat or thali used for making chappati dough pour flour in a mound. If you prefer you can also work directly on a flat, clean surface like your counter top or a wooden table. Make a well in the center of the flour about 3-4 inches wide. Sprinkle flour with a teaspoon of salt. Whisk eggs and carrot puree together then pour into the center well. Slowly incorporate flour into the eggs until you get a wet, sticky mix. Then using your fingers knead to form a shiny light orange-colored dough. If dough is sticky add more flour, a little at a time until the dough is smooth and rolls off your hand easily. Press the heel of your hand into the ball of dough, pushing your weight forward and downwards. Turn the dough over and knead again about 3-5 minutes. Continue until dough develops a shiny, elastic texture. When you push your finger into the center of the ball of dough your finger should come out clean. If the dough is too dry add a few drops of water, a little at a time and continue to knead. Rub your hands over the beet allowing the red color to stain your palms and fingers. Knead the carrot pasta again rubbing in the ruby color into the light orange dough. Repeat this 3-4 times. When you have a marbled effect you are happy with reserve the beet for the sauce. Rolling the Pasta: Generously flour a dry clean surface. Divide dough into 3 equal parts. Keep one wrapped in plastic. Knead dough again a few times. With a rolling pin, flatten the dough into a roughly round shape about 1/2 inch thick. Roll the pasta from the center out ensuring that the middle doesn’t get too thin. Flour surface again and flip the dough to the other side. Flour regularly as you roll to ensure pasta dough doesn’t stick. Continue rolling until you have a large and wide circle about 10 inches wide for one portion of dough. Keep flouring as required. The pasta shouldn’t stick to any surface. Using one palm to weigh the pasta down stretch the opposite end very gently in a slow and dragging motion. This should be repeated with the other side of the dough also. If this is too complicated you can simply thin the dough by rolling it. The motion is similar to rolling a chappati. The key is to have a dough that’s evenly thick. The thickness of the dough can vary. If you like a thick cut pasta, roll it about 1/5 inch thick and 1/6-1/7th inch for a thinner, finer pasta. At all times remember the pasta should not tear, break or thin out too much anywhere. Roll every one of the 3 pieces of dough into an oblong shaped circle about 4-5 inches long and 3-4 inches wides using a rolling pin on a well-floured and clean surface. Keep covered with plastic wrap or a moist cloth. Set pasta maker to widest setting and pass piece of dough twice through the machine at this setting. Then pass it through again at a medium thick setting twice. It will get longer and thinner. Narrow the setting again and roll the dough through the blades again. Repeat this sequence until the dough is the thickness you want. By the time you get to the thinnest setting on your machine the dough should now be delicate, smooth and a little stretchy in appearance, almost translucent. Place rolled dough onto a work surface or baking sheet lightly dusted with flour or lined with parchment or wax paper. Cover dough with plastic wrap or a clean, slightly damp kitchen towel to prevent drying, then repeat with remaining dough. If the weather is humid use plastic wrap or a dry cloth. The pasta sheets must be cut before they dry. Roll the rolled dough into a tube- you will need to roll it over approximately 3-4 times. Don’t press down on it, roll it loosely. I use a pizza wheel to slice my dough but you can also use a plain, sharp kitchen knife to slice the roll into vertical strips. The Italians have a guitar shaped tool called a Chittara that’s great for ribbon pasta. You can also use a non-serrated pastry wheel. I often use a ruler to first mark the pasta and then support my pizza or pastry wheel so I can ensure the strips are evenly cut. To Cut Noodles by Machine: Adjust pasta machine to noodle setting you prefer, in this case Angel Hair but you can do any other ribbon cut also. Work with one piece of dough at a time. Hold it up with both palms. Handle carefully so it doesn’t tear. 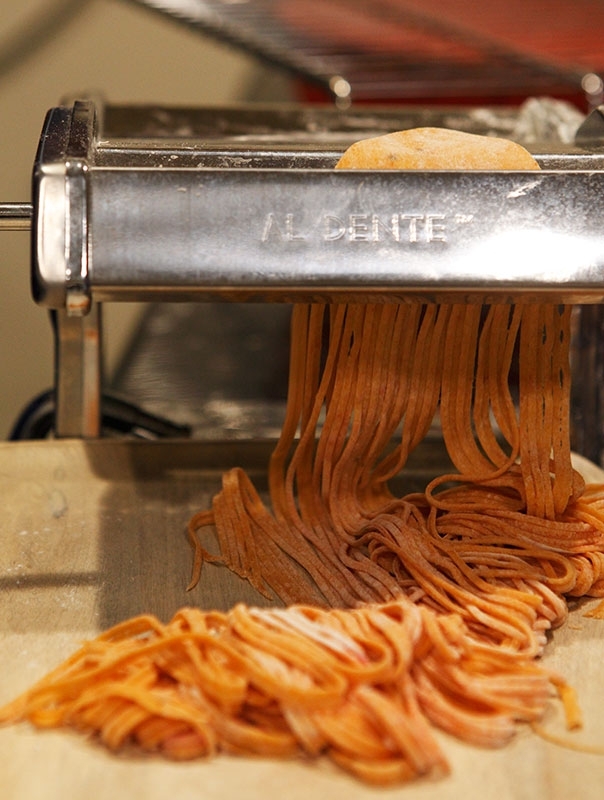 Fit one end of it in the center of the rolling blade while holding the tail end securely so the pasta rolls evenly. Dust pasta noodles lightly with flour, and make 4 individual mounds on a dry plate or baking tray if you plan to cook them immediately. If you want to dry them hang the strands out on a pasta rack, (I’ve even used a clothes drying rack) for about one hour. I don’t recommend freezing fresh pasta or refrigerating it in order to dry it. Fresh ribbon pasta shouldn’t be frozen it defeats the purpose- you may as well buy it at a store. Add all the pasta, stir gently with a pasta tong or chappati tongs to separate noodles, you can also use a large fork. Cook about 1 1/2 to 2 minutes. The thicker the pasta and the drier, the longer it will take to cook. 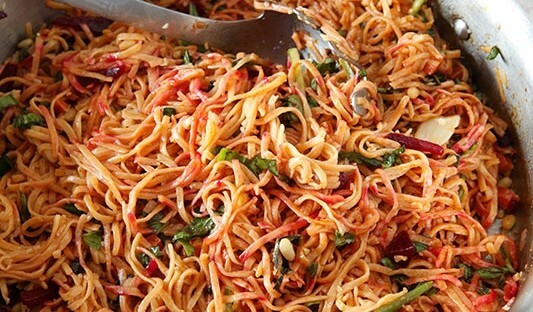 You will need to pull out a noodle from time to time and take a bite to see how well it’s done. Pasta should ideally be undercooked a minute, drained and tossed in a pan of hot sauce to complete the cooking. This allows the pasta to absorb the flavors of the sauce. In India’s warmer clime pasta cooks faster so I undercook mine by a minute and a half. This way by the time its been tossed with a hot sauce and carried to the dining table its still al dente. Put the flour in a large mixing bowl or paratand make a small depression in the center of the mound of flour. Add spinach and eggs and lightly mix flour and wet ingredients together with a fork. 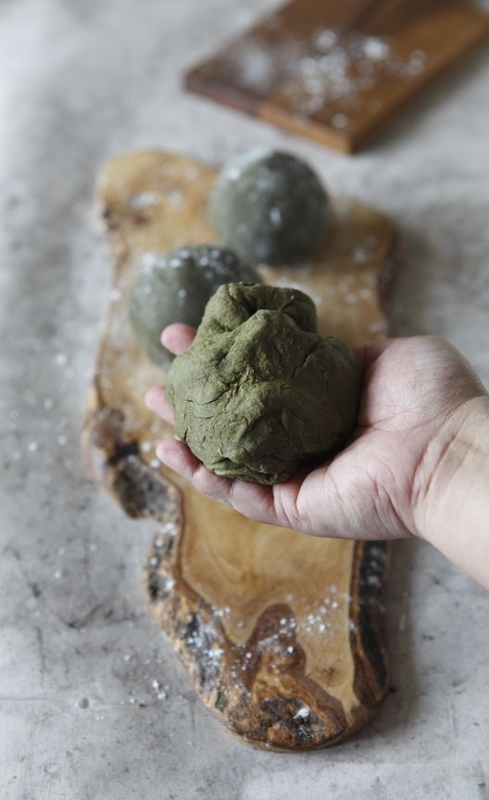 When dough becomes sticky, knead flour into spinach mixture with both hands until until everything is completely incorporated. Add more flour and continue kneading to form a firm and plaint dough that is no longer sticky. Cut dough into 4 pieces and knead again another 1-2 minutes. Then cover with a damp kitchen towel if you are working in dry weather conditions but if the weather is humid just place a clean cloth over the dough. 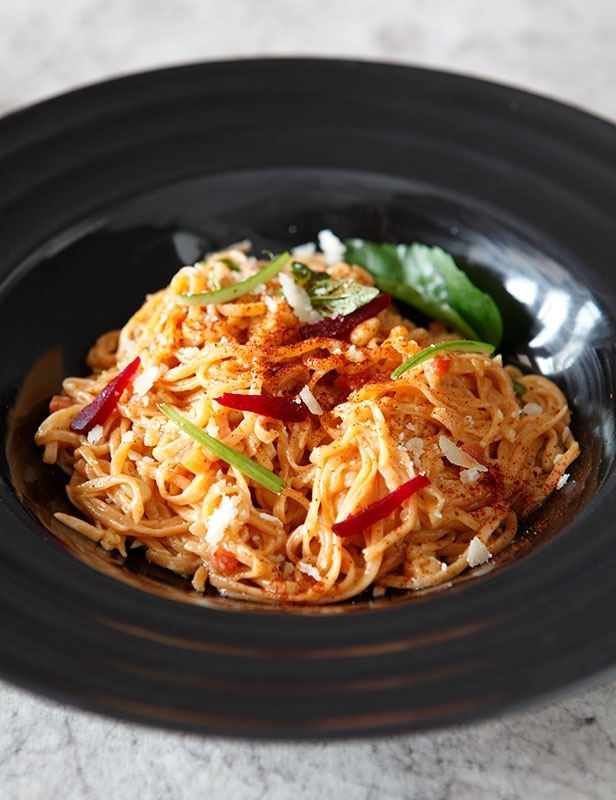 If you make this pasta during the monsoon season you will need more flour as there is greater humidity in the air. Set up your pasta machine in a clean space. Have some flour handy. A pasta drying rack if you have one. A cookie rack, even a totally washed and clean dish rack would work!! Work with 1 piece of dough at a time. Make a ball like you would for a chappati. Flatten it, roll it out just a little using a rolling pin. It must be a size that will fit through the rollers of the hand-cranked pasta machine. Sprinkle a little flour on the rollers and give them a few turns to ensure they work properly and are clean and dry. Otherwise the pasta may stick. Set rollers on widest setting, then holding dough with one hand, the other other free to turn the rollers, feed pasta into rollers 4-5 times. Hold it as it comes out of the pasta rollers to prevent it from breaking. Don't run it in too many times as pasta will become too thin and break. Once it is flattened to the maximum width of the machine decrease setting by 1 notch and feed narrow end of the pasta through rollers. Now decrease setting by 1 level each time until you get to the thinnest level and keep rolling out the pasta. Then lay out the lasagna sheets to dry one by one on a rack. If you want to make fettuccine set the machine blade to the appropriate setting and run the lasagna sheets through the machine. As the fettuccine comes out in long threads place in in a box and sprinkle lightly with flour to prevent sticking. Toss the noodles form time to time with flour to prevent sticking and clumping. If you plan to make the pasta later cover the uncooked fettuccine with a dry or damp cloth as per your weather and refrigerate in an air tight box for no more than 24 hours. Set a pot of water to boil with a pinch of soil. When bubbling hot boil pasta 6-8 minutes for an al dente texture. Drain completely. Toss immediately with your sauce and serve.